The new BMW 6 Series Gran Turismo Diesel Hatchback is luxurious, spacious and exclusive; it’s the ideal BMW for those to whom versatility and practicality matters just as much as style. Indeed, the GT gets some style points but the sheer amount of space and usability on offer is really what defines it. It’s smaller than an SUV and not quite an exec estate but sits somewhere between the two. It’s essentially a luxurious practical car with a total luggage capacity of 1,700-litres. Sound good? OSV takes a closer look at what it’s all about with our 2018 BMW 6 Series Gran Turismo Diesel Hatchback review. The Gran Turismo is a hefty car that needs big, powerful engines to complement it. BMW has certainly added a couple of brutish power plants but it ultimately comes up short on the handling front. If driver appeal is important to you, it’s a better idea to look at the 5 Series. The steering responses aren’t as sharp as we’ve come to expect from a BMW, while there’s more body lean than usual. Add the optional variable dampers and body roll will still be an issue. To keep the car as level and as flat as possible, you’ll need to add four-way suspension with active roll stabilisation. However, this is just another attempt to sharpen things up that doesn’t really work. Again, if driver involvement is a priority of yours, take a gander at the 5 Series. BMW is known for two things: Excellent engines and tidy – and often class-leading – handling. The former is definitely all present and correct, with the sole diesel engine able to produce 261bhp. It powers the 630d model which means – for the time being at least – there is no 620d model available. The 630d gets six cylinders and is less powerful than the 640i petrol model. To us, that’s a good thing as the amount of performance offered by the 640i seems too much for a car like this. The 630d is economical has a good amount of low-down punch, and it can be specified with four-wheel-drive. It feels grippy and secure, even without xDrive four-wheel-drive, but adding both xDrive and winter tyres is recommended if you’re planning to spend a lot of time out in compromising conditions. We have no complaints with the cabin, which is spacious and luxurious. In short, it’s impeccable. Build quality is, as ever, excellent, and comfort is second to none. Particularly if you specify active air suspension, you’ll feel as though you’re floating in the 6 Series GT. Even harsher surfaces are smoothed over with ease. Insulation is excellent, too, while the sports seats further enhance the easygoing nature of the car. They come with top-notch leather trim and strong support that keeps you guys in position at all times. They’re also heated, while a massage function costs £800. The dashboard is logically arranged and well put together. It’s a bit bigger than the usual BMW dashboard, but that’s simply because the GT is bigger. Fit and finish are great, and soft-touch plastics, wood and leather make up the majority of the materials used. Is the BMW 6 Series Gran Turismo Diesel Hatchback practical? It’s got bigger dimensions than the 5 Series Touring Estate and its practicality is one of the primary reasons buyers would choose this over another BMW. It’s stuffed with plenty of storage solutions, including large door pockets, and rear seated passengers are treated well. Visibility is good, as is leg and headroom, while the roofline won’t be a problem for most people. The boot, meanwhile, measures 570-litres. Fold the rear seats and you can extend that to 1,700. Standard kit across the range is good, with all models getting a powered boot lid, a rear view parking camera, power-adjusted heated seats, dual-zone climate control, LED fog lights, LED headlights, front and rear parking sensors, cruise control, a 20GB hard drive, sat-nav, a digital radio, adjustable ambient interior lighting, and the brands excellent iDrive infotainment system. BMW’s ConnectedDrive Services comes as standard too, and it gets you access to their Concierge Services, Apple CarPlay and other connectivity goodies. There are plenty of optional extras to choose from too, including a Premium Package that gets you massaging front seats, four-zone climate control and soft-closing doors. The £1,500 Technology Package will be worth a shout for anyone who wants a head-up display, BMW’s Display Key and wi-fi hotspot preparation. Adaptive air suspension, meanwhile, costs an extra £1,700. 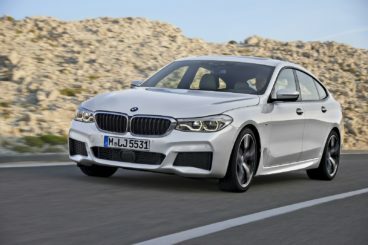 In terms of how safe the car is, the car received all five stars when it was crash-tested by Euro NCAP, and BMW is getting a reputation for producing some of the safest cars around. Its standard safety kit includes the brands ConnectedDrive Services, which gives you access to Emergency Call and traffic info, as well as all-round LED lights and automatic emergency braking. In terms of its running costs, there’s only one diesel engine available, a 261bhp unit that powers the 630d model. Unsurprisingly, it’s the most frugal engine in the range, and can return 53.3mpg economy. For a car that can do 0-62 in 6.1 seconds, we’d say that’s mighty impressive. The 630d is subject to the London Congestion Charge and is the most expensive engine in the range to ensure, sitting as it does in insurance group 44 out of 50. With a 570-litre boot, lots of storage spaces and plenty of room for rear seated passengers, the 6 Series GT is one of the most usable BMW’s on the market. It’s easy to make a case for the sole, straight-six diesel engine, as it’s both performative and reasonably economical. The diesel engine is smooth and quiet at speed. A high listing price combines with a high insurance grouping and expensive options. This refers to its looks and the way it drives. Let’s see how the car fares against its rivals in the comparison section of our 2018 BMW 6 Series Gran Turismo Diesel Hatchback review. The new Audi A7 is a visually striking car that’s great to drive and reasonably practical. It’s offered with a pretty smooth and powerful V6 petrol engine that develops 335bhp and comes paired up with a 7-speed dual-clutch automatic ‘box. But despite a 0-62 time of 5.3 seconds, it’s the diesel that grabs the attention. With plenty of torque in reserve and 282bhp, the 3.0-litre A7 50 TDI diesel engine has more pulling power than the petrol, is more economical and makes more sense. It can haul you from rest to 62mph in 5.7 seconds, comes mated to an 8-speed automatic transmission and makes very little noise. All models get Quattro four-wheel-drive as standard and drivers can choose from an array of suspension setups. All-wheel-steering is available too, while setting air suspension to its sportiest model turns the A7 into a remarkably lightweight and agile car. Running costs? It’s a large car but Audi has kept costs down by fitting cutting edge fuel-saving tech to their engines. As a result, the V6 petrol can return as much as 41.5mpg if you stick to the entry-level trim. It also emits 154g/km of CO2, and while these figures might have you frowning, they’re impressive for a car with this much weight and power. Official figures for the diesel have yet to be released. Inside, the A7 is gorgeously put together. The dashboard is clean and free from button overload, the low-slung seats give the car a sporty feel, and refinement is excellent. Comfort suspension does a decent job of smoothing out poorer road surfaces, but the car will feel unsettled if you opt for larger alloys. All models get the brands latest MMI infotainment system, the centre console is angled towards you … but the upper plastic air vents look and feel a bit cheap. 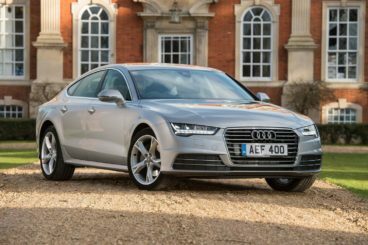 Is the Audi A7 practical? The interior is longer than last time, which means leg and knee room is better for rear seated passengers. Headroom has been boosted slightly too, while space upfront is just fine. The boot measures 535-litres and can be extended to 1,390 by folding the rear seats. The new four-door Mercedes CLS is now 14 years old – and buyers have finally accepted it for the excellent car that it is. 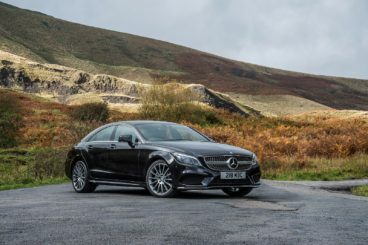 On the road, there’s no denying that the CLS packs a punch, but make no mistake – this is a luxurious car primed for comfort and relaxation than anything else. It’s also a huge car that struggles to hide its weight. It’s not going to tackle corners with the litheness of a coupe but it’s enjoyable enough to drive. 4MATIC four-wheel-drive comes as standard and it helps the CLS to keep its composure in poorer conditions. In terms of the engines, there are two six-cylinder diesels available at launch, with a few four-cylinder variants expected to follow shortly. A 350d straight-six unit develops 282bhp and has a 0-62 time of 5.7 seconds, while a 400d model develops 335bhp and is the most powerful diesel engine Mercedes has ever produced. The sheer amount of power available ensure it’s a fantastic cruiser and it comes paired up with a 9-speed automatic ‘box. Pulling power, meanwhile, is prodigious and it has a 0-62 time of 5.0 seconds flat. Running costs? If this is a priority of yours, you might have to wait until the smaller four-pot engines are released. As it is, the 350d model returns 48.7mpg at best, while the 400d model almost matches it with its returns of a 47.9mpg economy. Hardly bad figures. Inside, the CLS boasts a lavish interior that’s hard to fault. Fit and finish is excellent wherever you look, the design is easy on the eye, and ride quality is impeccable. It’s a fantastic way to travel. The dashboard is typically upmarket fare, feeling low-slung and wide enough to give you plenty of space. It can be finished in colour if you prefer, while a pair of 12.3” displays blend together to look as though they’re just one screen. Is the Mercedes CLS practical? It can seat five, but we wouldn’t recommend that you regularly head out on longer journeys with five people as the sloping roofline and an elevated centre seat will make things awkward for anyone sat in the middle. That said, most adults will find the amount of space on offer is just fine. The boot, meanwhile, measures 520-litres. Mixing typical BMW panache with steel and practicality, the new 6 Series GT sounds like the perfect car on paper. In reality? It doesn’t quite measure up. Sure, it’s a solid proposition but it feels top heavy on the road and doesn’t look as crisp as a BMW should. It’s a good idea but the new BMW 6 Series Gran Turismo Diesel Hatchback and its rivals need a proper assessment by you before you buy.